I'm very aware that most of my blog posts are very upbeat and optimistic. 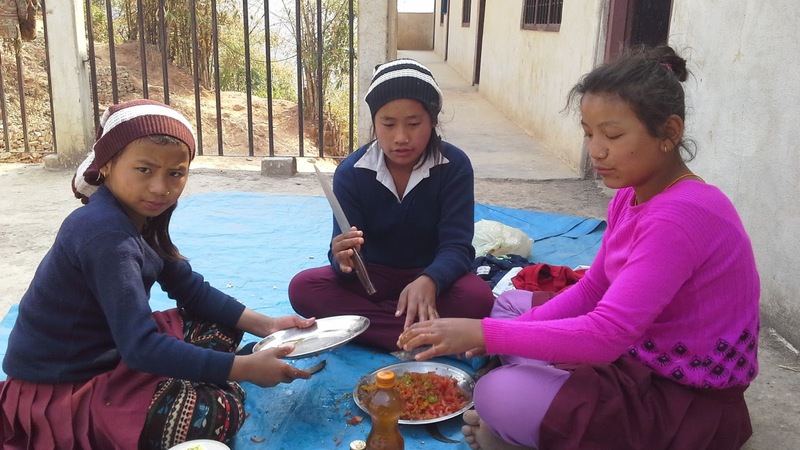 Manisha UK does a lot of good in Nepal, which I get excited about and like to shout about. But there are days when I question whether this country, that I genuinely love, has the capacity or the mentality to develop. Yesterday was one of those days. My wife is hoping to spend a year working in Korea (as am I). For her, as for so many young Nepalese, working abroad is the only way in which they can save money for the future. In order to do this, she needs to sit a Korean language exam with thousands of others, those with the best scores have a chance of being selected. Yesterday she went to pay the exam fee, about £20. This should be a simple matter, but Nepal lacks basic financial infrastructure to such an extent, that in order to pay for her exam she must travel 2 hours to another city, to deposit the money in the exam organisers bank account. This is bad enough, but as there are thousands of people who want to take the exam and a limited window in which to pay the exam fee, the nominated bank can't cope and allow only 300 people each day to pay their fee. For my wife, that means spending the night in another city so she can get up at 4 am to go and join the queue. It means 2 days off work and a missed class lessening her chances of securing top marks in the exam. How can a country hope to develop its economy when it is that hard to carry out what should be a very simple business transaction? There are so many ways that this could be done (online payments, paying at the exam centre on the day of the exam, sending payment via Western Union, or at least using a bank with a more extensive network of branches!) but so often Nepal seems determined to find the most difficult and least efficient way of getting things done. After visiting the bank and finding all this out, we went for some food. I ordered my favourite treat of chicken fried MoMo. These were brought to me a boy of maybe 10 or 11 years old. I was the only one there who even seemed to notice that we were all being served by child labour, a child who should be in primary school but instead has already been condemned to a life of poverty, with the same almost certain for his future children. MoMo have never tasted so bitter to me and I genuinely felt sick all afternoon, regretting that I ate in such place. Once again, I asked myself how a country can develop when exploitation of children is so readily accepted and normalised? When people can say, with a shrug of the shoulders, 'His family need the money' as if that makes it simple and ok? Yesterday was a day of despair. Today, I look at these challenges and I don't know if they can be overcome, if Nepal can change. But today I will work harder and longer and I'll know that if Nepal fails, it won't be because we didn't try. It's been a fairly busy couple of weeks, returning to several of the new libraries we have installed, meeting with different groups of people to talk about the Learning Resource Centre project and getting around to visiting those schools that already had libraries. We've now returned to each of the libraries we have set up in Palpa at least once and in some cases a couple of times. Schools are really making great efforts to utilise this resource and the check out registers show that children have been borrowing books to take home. 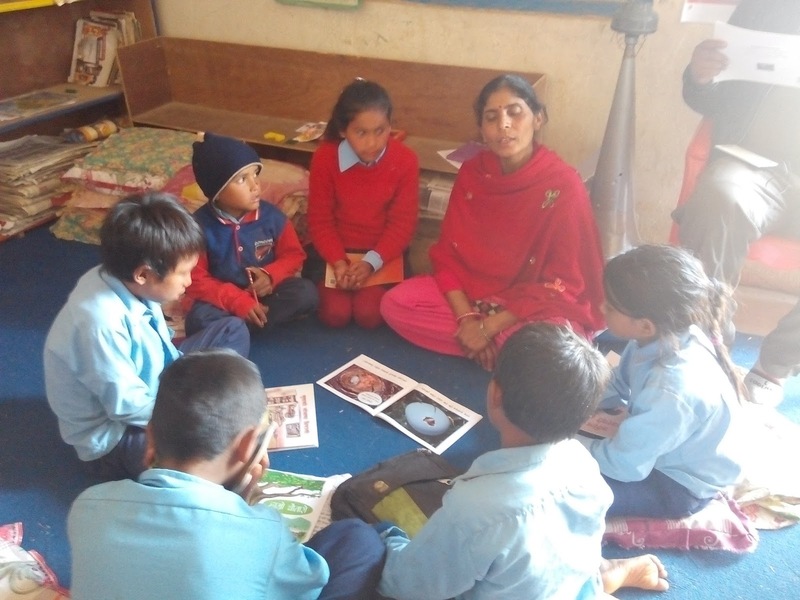 At Nava Durga School in Pipaldanda 30 children borrowed over 125 books in a few weeks while at Devwani School here in Tansen we saw children returning with the books they had borrowed on the previous day, demanding they be taken to the library so they could borrow more. Needless to say, this is exactly what we hoped for and it was just so pleasing to see! 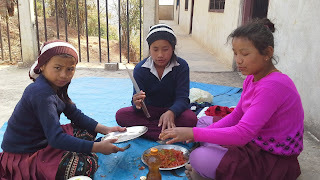 We arrived unannounced at Pipaldanda (we wanted to see how the library was really being used, not only when we were coming) and I was delighted to hear that the children would be having a cookery lesson in the afternoon. This sort of practical activity is really rare so I was curious to see how it would go. However, my enthusiasm was somewhat dampened when I saw two live chickens outside the office and realised that the lesson would involve butchering and cleaning the birds. I won't include any photos or videos, but I watched two year 5 children decapitate the chickens using a sickle. It was all very different to the cookery lessons I remember in school! At Himalaya School in Mahachhap we heard the sad news that over the year four boys from class 4 had left school to go and work as labourers in another city. It's unlikely that they'll ever return to education and working as low paid labourers is likely to be their lot for life now, their futures determined before they even reach their teenage years. With little education, no literacy and limited earning potential, it's likely that in the future they will rely on their own children to support them, continuing the cycle of poverty. 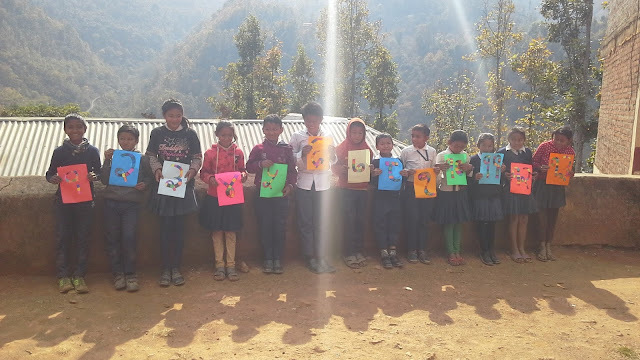 We had great news yesterday from Bhagawati Himalaya School in Batase, Gorkha. The local government were so inspired by the library we provided, and the enthusiasm of the children to run it and use it, that they have managed to secure an extra £3000 funding from the Ministry of Education to add to and improve the library. The library we provided was good, but with this extra funding, the school should be able to manage a really top class facility! Our project to set up a learning resource centre in Tansen with the Steve Sinnott Foundation continues to gather momentum. I've been meeting with and talking to children from different schools about what they would value in such a centre and how they would use it. I'd already spoken with a lot of schools 'top' students, but over the last couple of weeks, I've also managed to meet with students who struggle in school or are disengaged. The centre must be for all students so it is really important we gather a wide range of input. We've also set up a steering committee with school leaders, local government, local business and community and NGO representatives all on board to help ensure this is a full community effort. This has been really helpful in establishing what the local stakeholders really want and what we can realistically hope to achieve. The 'mela' (a type of fair) has been in town with all sorts of strange delights. I've seen a dancing camel (with serious reservations over his living standards), cars driving around the wheel of death, some seriously unsafe rides and even more unsafe 'queues' (I use the term loosely, as it suggests some sort of order! For many attractions, the crowds simply pushed and shoved to get their first at severe risk of causing a crush, even on the children's rides) and been persuaded to buy all manner of shoddy merchandise and overpriced food. But it all made a welcome change to the routine and is a very healthy boost to the local economy. During the last week Saran and I have visited the four schools that haven't had new libraries, and may be excused for feeling slightly neglected over the last couple of months. We spent time with the nursery teachers in each school, following up on training that Barbara and Hannah delivered last year, and made videos to send to the twin schools in the UK, either with student interviews or teaching how to count in Nepali. I was delighted to see that two schools have now not only provided their teachers with lesson planning diaries, but that they were actually being used. Teachers tend to follow text books here without planning lessons, but the planners showed teachers thinking about what resources they could use to improve lessons and giving consideration to what the actual point of the lesson was. A huge step forward and something to build on in the next few months. We're coming toward the end of the school year now in Nepal. The all important year 10 exams have started this week, and nervous looking teenagers with their heads in books can been seen everywhere. All other classes will start their exams in a weeks time, right down from nursery class through to year 12. We'll still be busy with our work on the learning resource centre and delivering training to teachers who are not invigilating exams, but ensuring our school visits don't cause any unwelcome disruptions while students need to concentrate.